As far as value and overall quality the DuroMax XP4850EH is hard to beat. In fact, DuroMax generator are excellent generators, especially when compared to what you pay. Let’s be honest, if you want the absolute best generator then you should be looking at Honda or Yamaha, but for most homeowners DuroMax makes fantastic generators for the money. Let’s take a close look at the DuroMax XP4850EH a dual-fuel generator that runs on either propane or gas. Highly versatile for demanding conditions, and during an emergency when gasoline may be hard to come by. I’ve been fortunate enough to review a lot of different Duromax generators. I say fortunate because they’re great machines and very tough. Before I look at the features and performance of a machine, I want to know that the equipment that I’m buying is going to last. As generators are never too cheap, it’s always good to know that you’re getting a machine that’s going to work hard and keep doing so for many years. 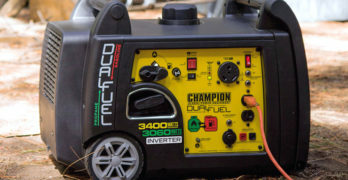 This article is going to focus on the DuroMax 4850EH dual-fuel generator, we’ll be reviewing every aspect of this model. We’ll also look at the DuroStar DS4400EHF Fortress Hybrid – a slightly less powerful generator but equally as impressive. If you’re wondering what’s the difference between DuroMax and DuroStar generators? You’re not alone. I’ve been asking the same question and there doesn’t seem to be a clear answer. The DuroStar brand is part of the DuroMax product range and is usually the cheaper option. More DuroMax generators are CARB certified than the DuroStar models and they tend to have a higher rated output – higher running and peak watts. However, this is not always the case. Some DuroMax generators are CARB certified and some are not. The same goes for DuroStar. Both have many different models with varying outputs. In the end, they seem like very similar generators and it shouldn’t really make a difference whether you buy a DuroMax or DuroStar generator – choose the one that best meets your needs. The prices vary, depending on where you buy the generator. DuroStar generators are often cheaper – but not always. Both the DuroMax and DuroStar brands come with the same warranty agreement. In my opinion, DuroMax offers excellent value for money. Their generators are not always the most advanced and you won’t find extra sound insulation, inverters and many of the bells and whistles that you get with a lot of other modern generators. What you’re getting is an affordable generator that’s built to be as tough as they come. You’re not paying for a lot of extras. DuroMax generators all have a really solid steel frame and four-point mounting systems. Their engines are also built for the long haul and all of them have cast iron sleeves. All DuroMax products meet ETL and MTL standards. All-in-all, DuroMax has concentrated on durability and is less concerned with pushing up the price by adding technology that many consumers might not need. You get the basics and they’re reliable safe generators. The company is based in Ontario, California but have an international footprint. DuroMax will ship spare parts for any of generators to anywhere in the world and have service centers around the US and in many other countries. Runs for 20 Hours on Propane or 8 Hours on Gasoline. Great performance. Will run for 20 Hours on Propane or 8 Hours on Gasoline. ✓ View or download the MANUAL for the DuroMax 4850EH. Like all DuroMax products, the XP4850EH is built to be tough and reliable. You can immediately see this in the rugged steel frame and large 10½” solid rubber wheels with steel rims. Call me old-fashioned, but steel rimmed wheels on a generator give me a sense of ease when it comes to quality. I know that many manufacturers use plastic wheels, they’re lighter and bring down the cost. Though let’s face it, steel is stronger and anyone building a quality generator should use high-quality materials – even where it’s not all that critical (like the wheels). This attention to detail in the use of robust materials in every aspect of the machine displays a commitment to quality. The main reason why I prefer DuroMax generators is that they are tough beasts and you’re not paying very much for this level of quality. The engine used to power the DuroMax 4850EH generator holds true to this philosophy of rugged design and build. It uses a 210cc 7HP 4-stroke OHV engine with cast iron sleeves (a DuroMax hallmark). This is a hybrid engine (dual fuel) which means it can run on regular gas or natural gas (propane). Both the generators that we’re reviewing here are hybrid models, so I’ll go into greater detail about hybrid engines after reviewing both generators. This generator is EPA certified but is not CARB certified and, therefore, is not for sale in California. For work or emergencies. It’s better to be safe than sorry. The really large muffler (with spark arrestor) is nice to see. This means that even though the DuroMAx 4850EH doesn’t have extra sound insulation, like the more expensive generators, it’s still exceptionally quiet for a standard generator design – 69dB (from 23 FT). If you’re standing right next to the generator when it’s running at high load, you’re going to have to raise your voice a bit to be heard. But if it’s only a short distance away, you can hold a conversation without speaking any louder than you normally would. The engine is protected with low oil shutoff. The alternator, that’s also built to last, gives you 3850 running watts and a peak power (starting watts) of 4850W. This the perfect amount of power for most standard RVs and will also give you enough amps to run most of your household electric appliances. It won’t have a problem starting a large refrigerator or room air conditioner, whilst running all your other appliances. You also have the protection of an Automatic Voltage Regulator (AVR), this means that your electrical equipment won’t be damaged by a spike in the voltage. Using the DuroMax 4850EH is a simple and effortless process. It starts very easily in all weather. The electric starter motor makes this totally effortless and if the onboard battery runs flat, you don’t have to worry because they’ve included a recoil starter for emergency starting. The control panel is easy to access and offers you all that you’ll need on a generator of this size without any extra complications. It has 2 X 120V 20A standard household power outlets and a has an L14-30 120V/240V 30A twist lock power outlet for RV use or running a 30A power supply to your home for emergency backup power. You’ll also get a 12V battery charging outlet and all the power outlets are protected by circuit breakers in case of a power overload or short circuit. There are no fancy gauges or complicate instruments and switches, all you get is a standard analog voltmeter. Your runtime is really good for a generator of this size and even more impressive when using propane. On a standard 20 LBS propane tank you can get around 20-hours at 50% load. The 4-gallon gas tank will supply power for about 8-hours at the same load. 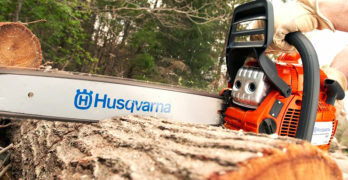 For a machine that uses such durable materials, the DuroMax 4850EH is surprisingly light at 140 LBS. I’ve already sung the praises for those robust wheels and they make it easy to move. Two fold-down handles add to the effortless mobility of the generator. It rests on solid rubber feet that, together with thick rubber wheels, reduce the vibration levels when running the generator. It’s reasonably compact for a generator that pumps out more than 4.5KW and is contained in a frame. It measures 23.2” (length) X 17” (width) X 17” (height). If you’re looking for a compact portable generator that will give you enough power to back up your home, running most of your essential appliances, during the hurricane season or the perfect generator for your RV, the DuroMax 4850EH is just about the best. I say this because of its quality vs price. You have the added advantage of the hybrid dual fuel engine. On the Amazon website, I see a 3-year warranty advertised for this generator. This doesn’t match the warranty agreement that I got from the DuroMax site. The official DuroMax warranty States that they offer a full 1-year warranty on all parts and a 90-day replacement warranty. I’d go with the official warranty and you may want to follow up on the 3-year warranty with the guys at Amazon – it could be a mistake. Maximum power from each of the 120-volt receptacles. Low oil protection, AC and DC regulators, and a spark arrestor. I’ve already pointed out that I can’t see any difference between DuroMax and DuroStar. If you look at the DuroStar DS440EHF, it looks pretty much the same as any DuroMax generator apart from the fact that it’s black and has a molded plastic control panel bearing the Fortress logo – giving it a slightly more modern look. All the components seem to be similar or identical to the DuroMax 4850EH and this is certainly a tough and durable generator, right down to the steel wheels that I like so much. The only difference between the DuroStar DS4400EHF Fortress and the DuroMax4850EH is that the DuroStar Fortress has a slightly smaller engine delivering a lower wattage. They are both Hybrid generators that can run on natural gas or regular gas. Like the DuroMax 4850EH, this one is also not CARB compliant and cannot be used in California. Although the engine on the DuroStar DS440EHF has the same 7HP rating as the DuroMax 4850EH, this one has a slightly smaller displacement of 196cc (only 14cc less than the 4850EH). It uses the same durable cast iron sleeves as all the other generators in the DuroMax product range and has a low oil shutoff. The slightly smaller engine means that you get fewer watts. The DuroStar DS440EHF delivers 3500W constant (running) power and 4500W peak power. Versatile fuel options allow you to have power under any conditions. The DuroStar Fortress also has the same muffler design with a spark arrestor. This means it has the same 69dBA noise levels. The engine is only a few ccs smaller and this doesn’t affect the fuel consumption in any significant way. The rated consumption at 50% load for the DuroStar Fortress is also 20-hours when using propane and 8-hours from the 4-gallon gas tank. The Fortress is a little lighter than the DuroMax 4850EH, weighing 128 LBS and its dimensions are 23.8” X 20” X 18”. The power outlets are the same. It has two120V household outlets and a 30A 120V/240V twist lock outlet, it also has a 12V battery charging outlet. The Fortress has the same analog voltmeter as the DuroMax 4850EH. The handles are the same as the other model and it’s just as easy to move – a little easier, in fact, because it’s a few pounds lighter. As you can see, these two generators are almost identical. The DuroStar DS4400EHF will give you 350W less running and peak power and it weighs 12 LBS less. This leaves me wondering why DuroMax has two generators that are so similar in performance, just with slightly different names. It must have something to do with marketing and I just don’t understand this. The DuroStar Fortress costs a little less than the DuroMax 4850EH, though this difference is very small and this may not always be the case – depending on the retailer. If you’re going to save a reasonable amount of money by opting for the DuroStar Fortress, it may be worth buying. If you’re going to be paying the same or very close to the same price for the DuroMax DS4850EH, it makes more sense to buy this one – you’re getting an extra 350 watts of power. The warranty is the same for both, 1-year on all parts and 90-day replacement warranty. Because dual-fuel generators cost more than a standard gas-only generator with the same specs, you might be wondering if it’s worth paying extra for a hybrid generator. I’m going to point out the benefits of using propane and leave you to decide whether it’s worth paying more for a generator with dual fuel operation. Natural gas (propane) has become more popular in recent times because of environmental concerns. Natural gas is a much cleaner burning fuel than regular gas. However, there a number of practical advantages to using propane. It’s much easier and safer to use – especially when transporting the fuel. A propane tank will not leak or spill and it doesn’t emit the fumes that you get from a gas can. Probably the biggest practical benefit of using propane is that it’s very compact. If you compare the size of a 20 LBS propane tank to 5-gallon gas can, they’re not all that different in size. Yet, you’ll get about twice as much runtime from the propane tank as you’ll get from the gas can. There is a slight disadvantage here because propane doesn’t usually give the same power output as gas. When running the generator on propane, it’s likely that your output wattage will be around 10% less than when you’re using gas. The clean burning properties of propane don’t only save the environment, it’s also better for the engine. There’s less carbon buildup inside the engine components and your oil doesn’t become diluted as it does with gas. This means that the engine is going to last longer and run more efficiently. I see that the guys who maintain these generators recommend that if you’re using propane exclusively, it can cause the fuel seals to become dry and brittle. It’s recommended that you run the generator on gas periodically – they suggest doing this monthly. I suppose this would be if you’re using the generator every day. If you’re only using your generator during the hurricane season or for vacations, I’d suggest running it on gas for a few minutes before you store it. Though, you must remember never to store a generator with gas in the carburetor. As the gas in the carburetor slowly evaporates over time, it will leave a sticky residue that can block the carburetor. The easiest way to drain the carburetor is to close the fuel tap while the engine is running. The last fuel in the carburetor will keep the engine running for a few seconds until the carburetor runs dry and the engine will stall. This will leave no fuel in carburetor and make it safe for storage, without causing any harm.